WHAT IS THE LEGEND OF THE MOON RABBIT? Since ancient times Man has considered the Moon to have special mystical powers. Myths and legends about it can be found in numerous cultures across the world, particularly in Aztec mythology and in East Asian folklore. 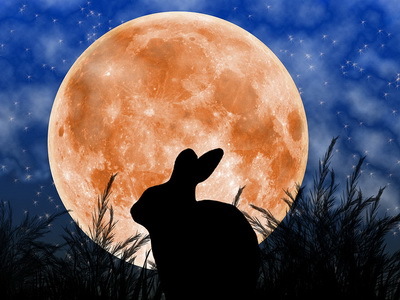 For almost as long as these stories have been around one animal in particular has been associated with the Moon – the rabbit or hare. The reason for this association is easy to understand. 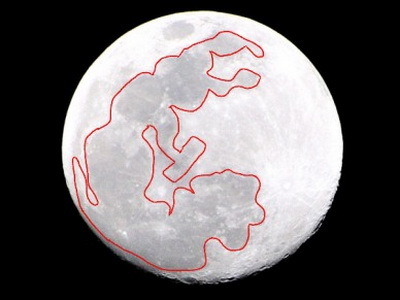 Seen on a full moon night, the lunar markings resemble the outline of a rabbit or hare in a standing posture. A glass or two of wine usually helps sharpen the image. In China the Moon Rabbit is often portrayed as the companion of the moon goddess Chang’e, and is the guardian of wild animals. It comes from the North Pole, bringing the greetings of the Moon Goddess, and is depicted with a mortar and pestle in which it constantly pounds the elixir of immortality for her, although in Japanese and Korean versions it is just pounding the ingredients for rice cake. 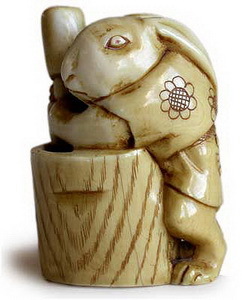 Figures of hares or white rabbits are commonly found at Chinese Moon Festivals, where they represent longevity, fertility, and the feminine power of yin. 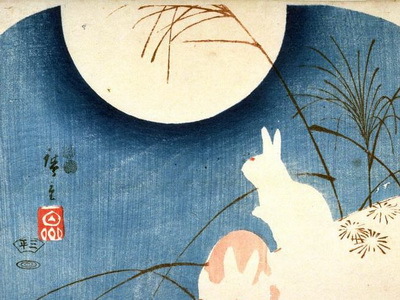 An early mention that there is a rabbit on the moon appears in the Chu Ci, a Western Han anthology of Chinese poems from the Warring States period, which notes that along with a toad, there is a rabbit on the moon who constantly pounds herbs for the immortals. This notion is supported by later texts, including the Imperial Readings of the Taiping Era encyclopedia of the Song Dynasty. 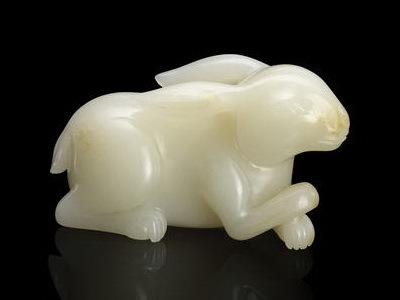 Han Dynasty poets call the rabbit on the moon the “Jade Rabbit” (玉兔) or the “Gold Rabbit” (金兔), and these phrases were often used in place of the word for the moon. One of the most famous poets of the Tang Dynasty period, Li Bai (701-761 AD), relates how: “The rabbit in the moon pounds the medicine in vain” in his poem “The Old Dust.” The poet supposedly drowned after falling from his boat trying to embrace the reflection of the moon in the Yangtze River. During his life he was almost as famous for imbibing wine as he was for his poetry, so there may be a grain of truth in the story, although it has never been verified. Nonetheless, it has entered Chinese culture as an illusionary concept associating poetry and the moon’s beauty. Interestingly, the Chinese language does not make a huge distinguish between rabbits and hares, so in English translations of Chinese folklore and mythology this celestial lagomorph is more frequently referred to as a hare. But that makes not the slightest difference. This long-eared furry creature has a special place in the hearts of many. We all know when we see the rabbit in the moon. Having lived in the East for many years, I have come to respect the creative spirit which drives the arts and crafts in this part of the world, adorning even the simplest and humblest of artifacts. I can’t help feeling that the moon rabbit helps the spirit of these crafts each time it pounds a little of the immortal elixir.